Many of the students in my class this year are struggling with vocabulary. It is really interfering with their reading comprehension, so I have been trying to come up with as many ways as I can to add any extra vocabulary instruction that I can. Enter the word of the day! I was actually inspired by a few of the Rotary members who visited our classroom to give dictionaries to each of the students. They handed out the dictionaries and told the students that whenever they looked up a word, they should underline it. Years later they could look back and see all of the words they learned in third grade. I really liked the idea, and have over the past few weeks, have developed it further. I started by putting a new vocabulary word on the board each day as our word of the day. I write the word in black and do not put the definition at first. I have the students look up the word in their dictionary when they come in during the morning. The students come up to me and show me the word underlined in their dictionary and tell me the meaning. I give them a sticker for our sticker economy. During our morning meeting, we put the definition under the word of the day in red. Throughout the day when we have transitions, I say either the word of the day or the definition, and they respond with the opposite. I have really noticed a difference as they begin using the words in their writing and conversations. They also get really excited when they see our words in the books they are reading. Today I thought up an additional enhancement. I am having the students complete this graphic organizer that lists the word, the dictionary definition, and a place for them to write the meaning in their own words. I am hoping that it will strengthen the lesson even more. You can find the template for the word of the day here. Special thanks to The School Supply Addict for this adorable button! Unless you have been under a rock, you no doubt have heard about the big sales over at TPT and TN this Monday and Tuesday! I can tell you that as a shopper I am super excited - I have 58 items in my wish list as we speak (I may be in need of help - lol!). There must be a support group for those of us addicted to Teachers Pay Teachers! Hello, My name is Kelly and I am addicted to cute lesson plans! LOL! Anyhow, I thought I might share a few of the goodies that are at the top of my list. The first on my list is this Interactive Math Journal packet from Jen at Runde's Room. I LOVE her math journal Sunday posts and I can't wait to get started on this in my classroom. I plan on buying it during the sale and then implementing it when we get back from Christmas Break. That will give me time to really explore the concept and get my mind wrapped around it. Next up is the Reading Response Journals Made Easy packet from Christina at Bunting, Books, and Bainbridge. (Are we noticing a theme here? I really want my kiddos journaling and writing!). And in between all that writing and journaling - we are going to be in need of some brain breaks (have I mentioned that my class is mostly boys?)! So, another item that will be hitting my cart is Brain Breaks for the classroom from Stephanie at Third Grade Thoughts. Do you own any of these items? Your thoughts? Any other items I should add to my list? •You must post 11 random things about yourself. •Answer the questions that the nominators set for you. •Create 11 questions for the people you nominate. •Choose 11 blogs you love (with less than 200 followers) and link them in your post. 2. I have 6 boys - yes all boys! 3. I serve on my city's ciy council - I am currently serving my second term. 4. I direct children's theater. 5. I grew up in Lake Tahoe. 7. I have a major slight addiction to Starbucks -- two words -Chai Latte - yummy! 8. My three youngest sons and I are hooked on Dance Moms (they have crushes on the girls and I can't help but stare at the train wrecks that happen between the moms). 9. I cannot function without my iphone (it is my mini-brain). 10. My hubby has several tattoos - but I could never get one EVER! I am deathly afraid of needles. 11. I have lived in the same city for the past 12 years - but as a child I moved a lot! I have lived in four different states and actually went to school in all four different states in my 6th grade year. Almost time to get off the computer to get some Thanksgiving cooking done! But... I did want to wish everyone a very Happy Thanksgiving and let you know that I am jumping on board the Cyber Monday train with sales at both my Teachers Pay Teachers and Teacher's Notebook stores. 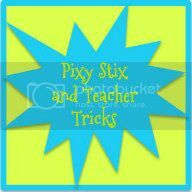 I am also linking up with the 3 AM teacher where you can find a ton of TPT sellers who will be joining the sale! Plus - she has some great clip art! I am not one of those lucky ducks who gets all of next week off - we have school on Monday and Tuesday. So... I was trying to come up with a few fun learning activities, and I came up with this We are Thankful writing prompt and craftivity. I have posted the template and graphic organizers as a freebie on my TPT store for anyone who is in the same boat as me :) I will post final pics from the kiddos when they are complete, but for now hopeful my sample gives you a rough idea of what it will look like. If you head over to We Give Books, you can read this fun story from award-winning author Kathryn Lasky and illustrator John Manders that reveals the lives of America's first troublemakers - as well as tons of fascinating Pilgrim facts-with kid-friendly humor. It would make a great listening center or a whole group activity on a Smartboard. Every morning I post a morning message that reviews something we have been learning, or showcases something we are about to learn that day. In the message I purposely make errors that I see the kiddos making in their own writing (not capitalizing proper nouns, forgetting to indent, etc.). The kids have to find my mistakes, and when they do they earn a sticker in our sticker economy. I tried something a little different today with a find a word activity. I had the students see what words they could make with the word "veteran". I had some interesting results (just a few shown below) and some teaching points to work on. Do you use a morning message with your class? What things do you include? 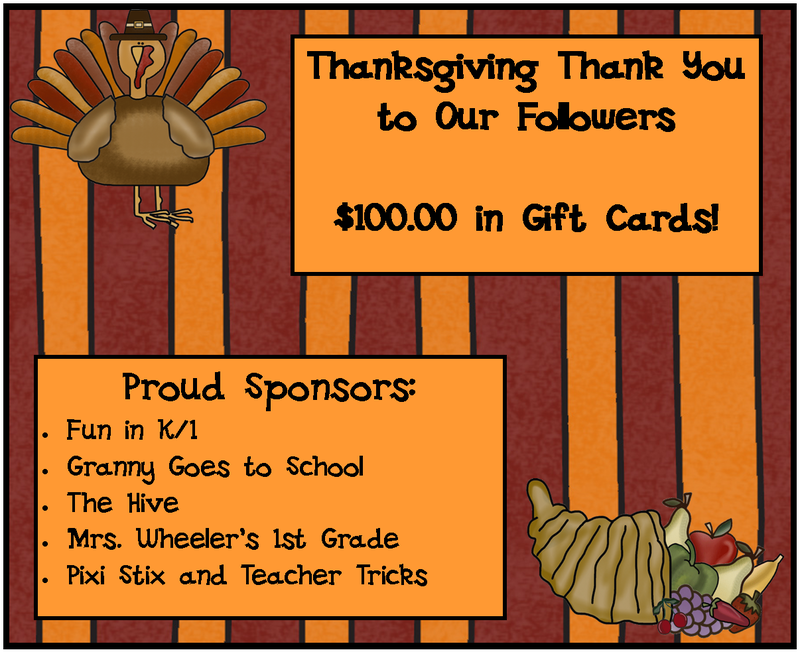 Thanksgiving is a great time to show appreciation and a few of my favorite blogs have gotten together sponsor a "Thanksgiving Thank You- Gift Card Give Away"
Teresa at Fun in K-1 will be giving away a $20.00 Gift Card to Target. Cindy at Granny Goes to School will be giving away a $20.00 Gift Card to Old Navy. 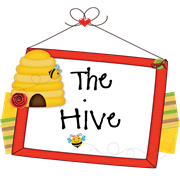 Rikki at The Hive will be giving away a $20.00 Gift Card to MAC Cosmetics. 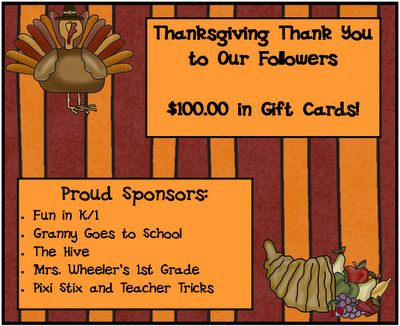 Megan at Mrs. Wheeler's First Grade is giving away a $20.00 Gift Card to The Limited. Head over to Granny Goes to School to enter now! This week we begin our unit on non-fiction. One of the resources I will be using are these 3rd Grade Reading Comprehension Worksheets from K12.com. The site also features free reading comprehension worksheets for other grades as well. I will be printing out worksheets from the other grade levels to help differentiate for my kiddos. I have a few kiddos reading at a first grade level, and a few reading at a 5th grade level, so I love that I can do this. The site features 36 free printable passages (you could use one a week or pick a few to focus on during a non-fiction unit like I am). The passages include a a cross-curricular focus on earth science, physical science, history, social sciences, mathematics and life sciences. This allows students to build their reading comprehension skills and reinforce knowledge in other subject areas. Hope you find them as useful as I did! Well, I missed a few months, but decided to get it in gear for this month with Farley's Currently! The other day I handed a free lunch notification letter to one of my students (they come in envelopes for the student's privacy). She asked, "What is this? Is it bad?" I know that as teachers sometimes we get so bogged down with all of the other things that we do, that the only communication that goes home is negative. I hated thinking that my kiddos think that whenever a note goes home to their parents it means that they did something wrong. So... I started sending home notes that celebrate their successes! I started with just a few students this week who had STAR tested (Accelerated Reader) or had 100% on Accelerated Math. I added a few personal notes to make it even more personal and special. What ways do you share good news with your parents?